Recently, I have upgraded my Cisco 2650XM from 12.3 to 12.4 version; I use it to connect my PC to Internet, but something goes wrong. After the upgrading, I have tried to downlad an ISO image but the speed was very low (about 300KB/s and not 700KB/s). Mhhh this is strange! I have begun the troubleshooting but no error, no warning message. So I have reset my current configuration, but nothing… no real improvement. Fortunately my better friend (google hihihi) help me and I have found how to fix the ‘download speed’: define manually the ‘clockrate’ into the atm interface! In fact, if you don’t define the clock rate command into the atm interface, the IOS set to 2600000 this parameter. To force it, use the command ‘clock rate aal5’; in my case I use the command ‘clock rate aal5 7000000’. 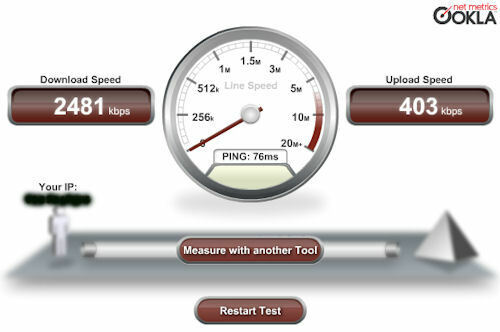 Below the download speed test guarantee the bandwith improvement. NAT Virtual Interface aka NVI, what is that? !